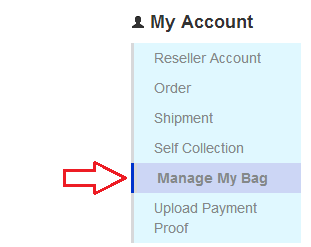 1) Proceed to 'Manage My Bag' to request for shipment. 2) Kindly key in the quantity you want and select 'Proceed' to proceed. You may combine several product code & attribute to proceed the shipment. 3) Select your Shipment Method , Fill in the address correctly , Select the 'Service' you want to use. Take note : For this transaction , you are paying for the shipment fees only . For Self Collect , you will still need to select 'Continue to payment' to proceed. 4) Kindly select 'Reseller Account's icon' as Payment Method. 5) Amount for your shipment rate will be displayed. Kindly click 'Confirm Order Now' to proceed . 7) Check your shipment accordingly. You are most welcome to contact us at cassafashion1@gmail.com for further enquiries.